Growing summer squash is easy, even for newbie gardeners. Few vegetables yield so much for so little effort. That’s the problem. All summer long, 2 or 3 healthy zucchini, patty pan, or crookneck vines will produce more summer squash than a family of 5 can eat, even if they “get creative” in the kitchen. Planting Too Many. People usually buy squash seedlings from nurseries in 6-packs, and they can’t resist planting all 6. Summer squash are vigorous plants, so most, if not all, survive transplanting. Once they start producing, you can’t keep up. 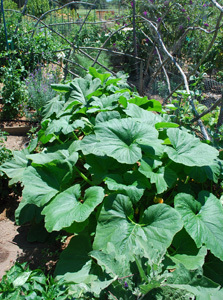 Plant no more than 3 summer squash for a family of 4, to avoid baseball bat zucchinis and a burdensome surplus. If you live where pocket gophers are a problem, plant 4, because pocket gophers are partial to young squash root crowns. Waiting Too Long to Harvest. Summer squash are at their best when they’re small and tender. Harvest summer squash small, while their skins are still thin, and before they’ve developed seed cavities. When growing zucchini and other summer squash, you must RESIST the Gardener’s Hoarding Instinct that says bigger is always better. Sometimes, the garden hoarder is your friend. Bigger usually is better for winter squash. But for summer squash, bigger is mealier (mushier), starchier (less sweet), coarser (more fibrous), stringier, and seedier. With summer squash, bigger is worse, not better. Pick summer squash small! Saute them lightly in a little olive oil or butter until crisp-tender—it won’t take long!—and toss coarsely-chopped basil or summer savory, or other fresh herbs on for the last minute of cooking. Season with salt and pepper. Delicious! Whether you’re growing summer squash or winter squash, the plants are close cousins and share the same soil, fertilizer, and water needs, the same pests and diseases. 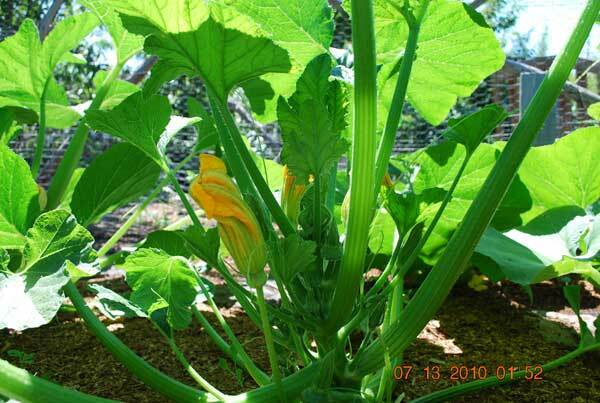 See How to Grow Squash for more information. If you’re interested in growing squash in containers, click Here.